In tonight’s CHICAGOLAND, Mayor Rahm Emanuel recruits Common, Dwayne Wade, and Magic Johnson to help him promote the city’s youth programs. After meeting a promising young man at Windy City Hoops, a community basketball program, Mayor Emanuel decides to mentor young Martell Cowan and offers him an internship in his office. Another young Chicagoan with promise, Chance the Rapper, makes his Lollapalooza music festival debut in front of the biggest crowd of his life, but remains haunted by the murder of his friend, Columbia College student Kevin Ambrose, from earlier in the summer. Principal Liz Dozier helps former Fenger High School student Jason Barrett secure an early release from prison – and a second chance – but with old temptations looming outside of the prison walls, which path will he take? Executive produced by Robert Redford and Laura Michalchyshyn of Sundance Productions, and Marc Levin and Mark Benjamin of the Peabody Award-winning team that created BRICK CITY, CHICAGOLAND explores where politics and policy meet real people’s lives in the beloved heartland American city of Chicago. 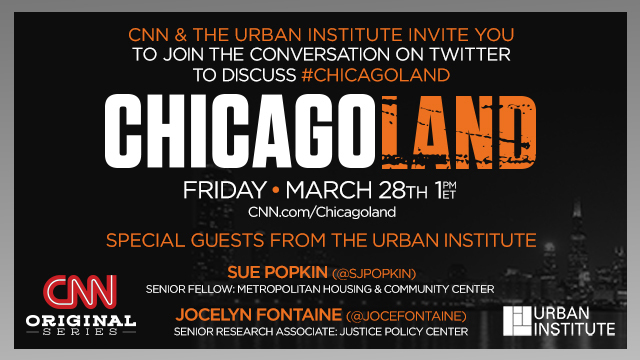 CHICAGOLAND airs Thursdays at 10:00pm ET and PT on CNN/U.S. For more information on the series, please visit www.cnn.com/chicagoland, or connect with the series creators via social media by using #Chicagoland.